A time or two over the years, I’ve had the idle thought: What if, after Whiskeytown disbanded and its members went their separate ways, Caitlin Cary rather than Ryan Adams had been the one to hit it big? How might Ryan’s life have turned out then? While it doesn’t offer a hundred-percent accurate analog for either person, something like that alternative reality is the backdrop to Don Lee’s very fine new novel, “Lonesome Lies Before Us,” which is as tragicomic and shatteringly sad as, well, a Ryan Adams song. The main character in “Lonesome Lies Before Us” is Yadin Park, an alternative-country singer/songwriter modeled roughly on the real-life musicians Damien Jurado and Richard Buckner. But like Ryan, Yadin suffers from Miniere’s Disease — only Yadin’s case is severe enough to have forced his retirement as a professional musician. Having retreated from the spotlight, Yadin lives a quiet life in small-town California. The story opens with him drifting into middle age while working as a carpet installer, and trying to keep from going numb in a loveless relationship of convenience with his boss’s daughter. Lee’s portrait seems pretty much exactly how things might have gone for Ryan if music hadn’t worked out as a career. From afar, Yadin follows the career of his long-ago bandmate and girlfriend Mallory Wicks. Caitlin was never Ryan’s girlfriend, but she and Mallory are both fiddlers who learned the instrument by the Suzuki method. And in this book, Mallory is the one who went on to a high-profile and glamorous career involving stage, screen and radio hits. In the grips of a crisis of spiritual faith, and with his hearing beginning to fade as his life threatens to fall apart, Yadin suddenly finds himself writing songs again for the first time in years. So he resolves to make one last album to put out into the world before disappearing from the scene for good (which he has to keep secret from his disapproving boss and girlfriend). That’s when Mallory unexpectedly reappears, in a reckoning that forces both of them to contemplate their individual and shared histories as well as motivations about music, art and life. It’s a fine read and a tale well-told, with a conclusion as tragic as it is inevitable. I first got the idea for the novel when I read that Ryan Adams had contracted Ménière’s disease and was afraid he’d have to quit music. That really intrigued me, so I embarked on this story about an indie singer-songwriter losing his hearing to Ménière’s, who wants to self-release one last album. But the model for Yadin was more Richard Buckner and Damien Jurado, homely guys who don’t have much stage presence. The model for the Yadin-Mallory duo was more Jason Isbell and Amanda Shires, Mandolin Orange and HoneyHoney (all with female fiddle players). Also I thought a lot about the Civil Wars, and Damien Rice and Lisa Hannigan, and of course Gram and Emmylou. That film about Gram, “Fallen Angel,” was a big source of inspiration. “Losering” was instrumental as a source. A chapter toward the end is a flashback to when the characters had been alt-country musicians in Raleigh, and I cribbed much of the local flavor from your book. I wouldn’t have been able to write that chapter without “Losering,” which really is terrific. I loved it. As covered in “Losering” as well as (repeatedly!) on this blog, Ryan Adams has chosen to stay away from his former hometown of Raleigh for a very, very long time. As of this month, June 2016, it’s been more than 11 years since the last time he played a concert anywhere in North Carolina. But Ryan’s old Whiskeytown bandmate Caitlin Cary remains a very visible part of the local music, arts and activist community here. You could even describe Caitlin’s recent artistic efforts as an ongoing love letter to Raleigh. Using a technique she’s dubbed “Needle Print,” Caitlin makes “Freehand Sewn Collage” depictions of famous as well as obscure structures in the city — from some of Raleigh’s most iconic buildings down to dwellings known only to the people who live there. Caitlin has been doing these works for a couple of years, rendering local scenes in the highly unusual medium of discarded upholstery fabric. And by now, she’s built up enough of a body of work to rate a feature in the Sunday paper. So that’s what I did. You can see the story here — with fantastic pictures from the always-reliable Juli Leonard, an N&O co-worker of mine who also put in fine work on last year’s Connells video update — and check samples of Caitlin’s work here. ADDENDUM (6/25/16): Another feature on Caitlin, this one in Nashville Interiors. Here’s something that turned up recently, a long-ago token I’d forgotten all about. It’s a laminate designed by Whiskeytown drummer/noted graphic artist Skillet Gilmore, and it dates back to the band’s interminable period of limbo in 1999 after recording what eventually came out as the album Pneumonia in 2001 (more about that time is in “Losering” — Chapter 11, fittingly enough). While the band waited around for its fate to be decided after the Universal/PolyGram merger vaporized its label Outpost Records, Ryan Adams played a solo tour that included a handful of epic Triangle shows in the fall of ’99. Whiskeytown was winding down and becoming less and less of a going concern as the stalemate dragged on; but the band was booked into Cat’s Cradle nightclub in Carrboro for a New Year’s Eve show on Dec. 31, 1999. Whiskeytown hadn’t played a local show in a while, and this one was deemed to be enough of a big deal for the band to do up a few of these “LIMITED PRESS ACCESS” laminates. They were kind enough to give me one, although all these years later I cannot recall what access it granted. But I’m glad to still have it. 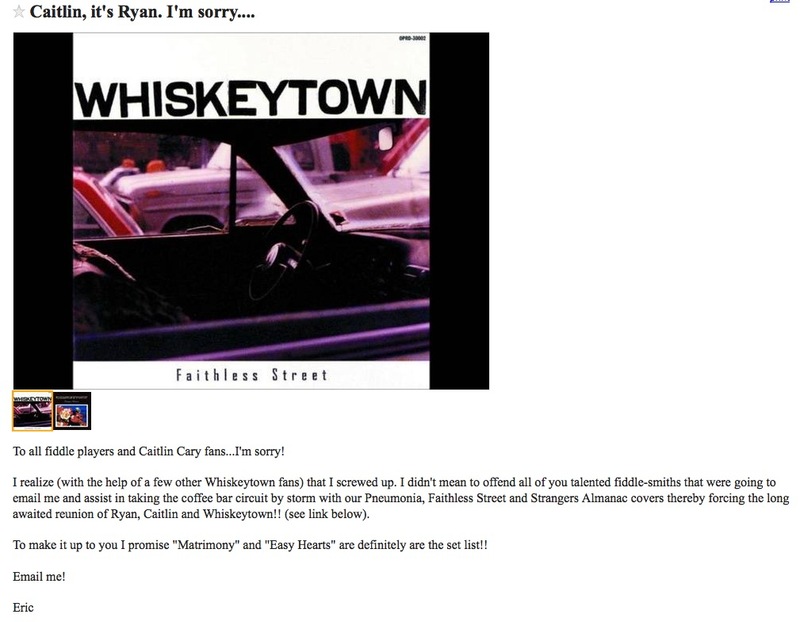 So a bunch of us had some fun the other day at this poor fellow’s expense, for misspelling Whiskeytown alumnus Caitlin Cary’s name in a craigslist posting. But I probably should not be so quick to ridicule because the poster, Eric from Portland, has owned up to the mistake and corrected it in a followup solicitation. And for all you fiddle-playing women singers out there — dude is still looking. Just sayin’. I think that this Eric fellow, who posted the craigslist solicitation below in Portland a week ago, might be a little more credible if he’d spelled Caitlin Cary’s name correctly. But I do wish him luck. As a deejay, I think I’m a decent writer. 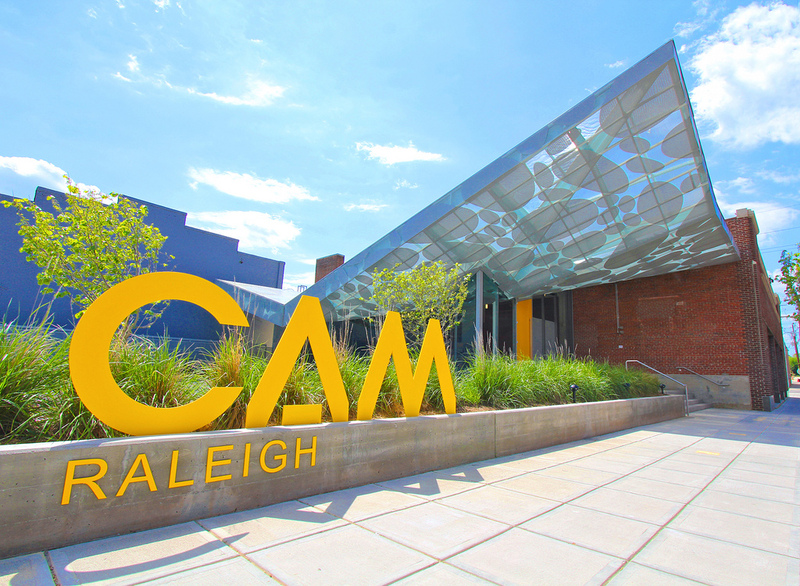 Nevertheless, for the first time ever I’m going to give actual live, public deejaying a whirl this week at the Contemporary Art Museum in downtown Raleigh. 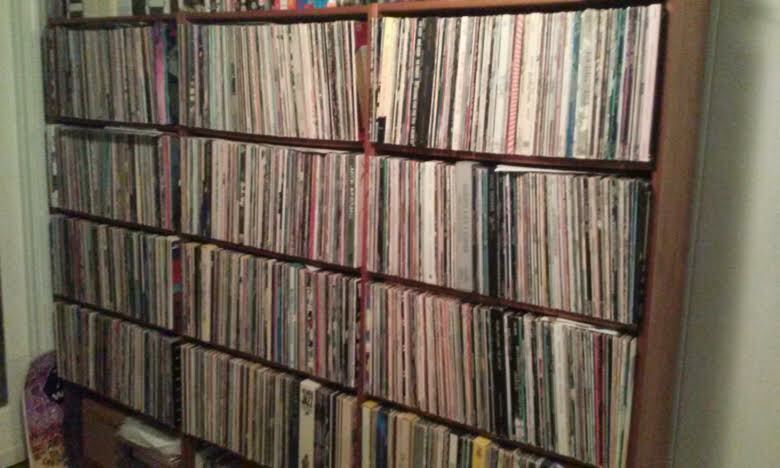 As part of the museum’s current “Big Bent Ears” (which is billed as a “multimedia installation about listening,” showing at CAM until Dec. 3), exhibit co-curator Sam Stephenson is inviting different people to come in for guest-deejay shifts. My turn in the rotation will be 8-10 p.m. this Thursday, Sept. 24. The guest-deejay part of “Big Bent Ears” is called Kissa, referring to the listening salons that originated in Japan in the 1950s. These deejay shifts have been happening at CAM since early June, tapping a wide range of guests including Whiskeytown alumni Steve Grothmann, Caitlin Cary and Skillet Gilmore, plus Branford Marsalis and members of Hiss Golden Messenger, Chatham County Line, Superchunk, Mountain Goats, Cousins, Art of Cool and other local-music notables. “Bastards I Used to Know” was one of the earliest Whiskeytown songs, and it still lingers even though it was never released on a record. 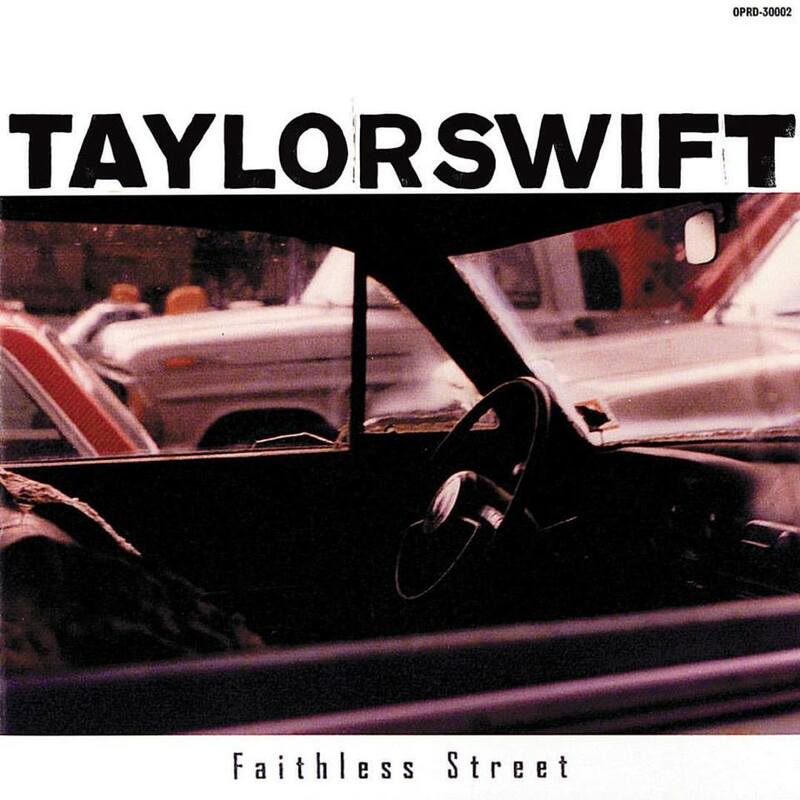 Also variously known as “Lucky Me” and “This Old City,” “Bastards” kind of stumbles along on the demo-ish recording of it that survives, with Ryan Adams and Caitlin Cary still working out their vocal-harmony dynamic. It’s ragged but wonderful in a shambolic sort of way, like a drunken younger cousin of the old Jerry Jeff Walker warhorse “Up Against the Wall Redneck Mother.” But where that song was pointedly tongue-in-cheek, this one is bitter to the core. Should your Labor Day cookout today take a turn toward the inebriated, you could do a lot worse than this for group-sing-along fodder. So fire it up. That’s crazy. I took that photo of Ryan in Wyoming while driving to Seattle. We all stopped to take a break and there were all these pretty daisies growing on the side of the road. I sent it in years ago to a contest for best ryan photo. 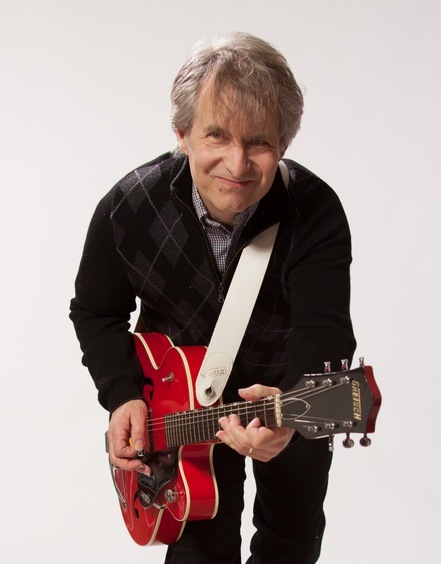 It’s not much of an overstatement to call Chris Stamey one of the great father figures to the music community around greater Chapel Hill, where the dB’s co-founder has toiled in the studio trenches with great honor for more than two decades. Chris was a key player in the early phases of the Whiskeytown saga, lending studio savvy at various junctures through the 1990s (including production of the great 1998 “lost” album, Forever Valentine). He also produced some spectacular post-Whiskeytown solo albums for Caitlin Cary. More recently, Chris has served as producer, mentor and fixer for an entire generation of younger area artists, working with them on recordings and shows like the ongoing live performances of Big Star’s Third that he oversees. Brett Harris, Jeff Crawford, Skylar Gudasz and Django Haskins, among many others, have benefited greatly from the master’s assistance and guidance. Somehow, Chris finds time to continue making records of his own, too. The latest is the aptly titled Euphoria (Yep Roc Records), a full-on rock record after the chamber-pop detour of 2013’s Lovesick Blues. Euphoria brings together a lot of the young guns from Stamey’s circle, alongside fellow North Carolina legends like Mitch Easter, figurehead of ’80s college-radio legends Let’s Active. Of particular interest to Planet “Losering,” the album opens with a previously unheard song written by our man Ryan Adams, “Universe-Sized Arms.” Ryan wrote “Universe-Sized Arms” as a driving rocker, and Chris added a very cool orchestrated arrangement reminiscent of the old “James Bond” spy-movie soundtracks. 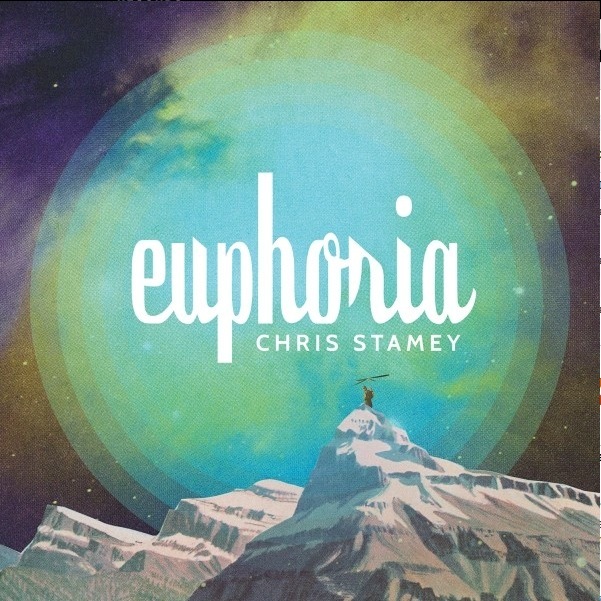 Euphoria‘s other 12 tracks are quite fine as well, with Stamey’s usual surplus of melodic goodness plus a nifty bonus-track cover of the 1971 Tommy James hit “Draggin’ the Line” to boot. Chris will unveil Euphoria with an album-release show Saturday night in Carrboro, and you can read a bit more about the record and details about the show here. I’m also delighted to be able to premiere the “Universe-Sized Arms” video below. Enjoy, y’all. Today, June 8, marks a notable double-digit anniversary, and I ain’t talking about Nancy Sinatra’s 75th birthday. No, today makes exactly 10 long years since Ryan Adams last played his old hometown. It happened about a month after the release of Cold Roses (the first of three albums he would release in 2005), drawing a soldout crowd to Meymandi Concert Hall in downtown Raleigh, and it was an evening fraught with tension — but also release and redemption. There’s plenty more about that in the closing stretch of “Losering,” as well as in this post. I’m still not sure what that’s supposed to mean. If there are people still nursing grudges in the greater Raleigh vicinity, they’re far, far outnumbered by the legions of fans who would love to see Ryan here. And as I wrote in the “Losering” preface, Ryan is remembered more fondly in Raleigh than he may realize. Yet he chooses to keep his distance, and so it goes. I hope the boycott ends someday, and ends well. If it doesn’t…well, I guess we’ll always have Meymandi.